The RAF Red Arrows are being forced to change their flight path at an air show because of nesting birds. Great Yarmouth Air Show is in talks with the Civil Aviation Authority (CAA) over a new route to avoid disturbing little tern colonies at Scroby Sands and the beach at North Denes. The RSPB wants the show to be postponed until September when nesting is over. An organiser said it was "frustrating" having to make the adjustments with just three weeks to go. The bird charity said it had raised concerns with Great Yarmouth Borough Council and the CAA in October 2016 about the air show being held at this time of year. It said aircraft passing close to and over Scroby Sands, "will cause the adult birds to fly up from the nests" and may cause some to abandon their nests and chicks. According to the RSPB, little terns are in decline across Europe and are among the UK's rarest sea birds. Natural England manages Scroby Sands, a legally protected site of global importance for wildlife, and little terns are a protected species. "We are also concerned that Natural England will allow Great Yarmouth Air Show to proceed despite these legal protections," the RSPB said. 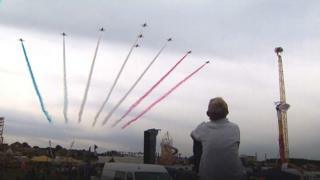 Show director Kevin Marsh said they had already made two adjustments to the Red Arrows' flight path to give the colonies a wider berth. He said the new flight path proposal was for the RAF display team only as it requires a longer fly-past to be able to do their turns and would not affect other aircraft. "It's frustrating the agencies have got us to a position but there was never a threat to the show. "The CAA didn't understand their responsibility with regards to protecting the habitat," he added. The CAA said it was considering an application from the air show but "approval was subject to ongoing discussion between the organisers and their various local stakeholders". The show which was cancelled last year has cost £650,000 to stage and 175,000 people are expected to attend.